I am an outsider in the world of comic books. I don’t follow graphic novels, although like most people I have several on my bookshelves. My work as an artist has been with sculpture, not drawing. One of the joys in art are all of the unexpected paths it can open up. I couldn’t have known, for instance, that drawing and storytelling would become a central part of my first solo exhibition. These graphic stories differ in a number of ways from what may typically be thought of as graphic narratives or comics. In addition, I chose a graphic narrative form; it wasn’t a given. This, I think, makes my experience helpful in understanding how we communicate through pictures. As early as 2006 I began to hear stories of the Canadians who were serving in Afghanistan. Over the next few years this became a big deal in my community. I was out of the army by then but these were my friends, people I had served with before becoming an artist more or less full time. Because of the war in Afghanistan they returned and departed on this new work schedule like slow motion commuters. Ours was a militia regiment, so in addition to being soldiers they were also postal workers, engineers, carpenters and the like. They were deployed singularly or in small groups within larger regular army units resulting in a wide variety of encounters. Some of my friends experienced combat in ditches and alleys while others viewed Afghanistan from hundreds of feet in the air, amid the wreckage of a suicide bomb, or through the glow of a monitor’s screen. 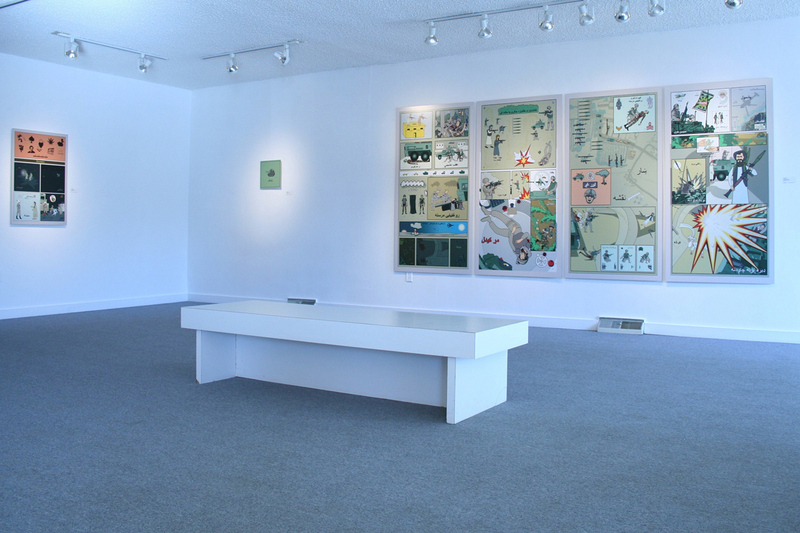 My conversations with them resulted in approximately twenty sculptures and drawings exhibited as Light Horse Tales of an Afghan War. Like most artists I’m inspired by what others have done but this can work in the reverse as well. What I wanted to produce were impressions of these experiences as visual art without any conscious moral lighting. I was, still am, convinced that journalism (as written, filmed or photographed) leaves open certain blind spots that only art, specifically visual art, can fill. So I was confident that there was legitimate space for this work in what was an already crowded subject. No photography or explanation would be a part of the displays, although a catalog was produced. The project began with the urge to share these experiences. My former comrades would have all this detail and a sense of how bizarre their time in Afghanistan was. What they told was always laid out in a very matter-of-fact manner. Conversations were informal, we would just be walking the dog or relaxing in the kitchen. To begin with I had no idea how to translate the stories. In some instances an image would develop and that moment would become a sculpture, a fixed state of being. But this approach couldn’t deal with all of the material I was handed. I began to play around with just sketching out the narrative. I’d make cartoons over scribbled words relating the story as it unfolded, basically a storyboard. I was learning the stories but getting nowhere with them visually. At some point from under cups of coffee, piles of notes, maps, and souvenirs, the army’s translation pamphlets captured my attention. These pamphlets aimed to bridge the gap between cultures. They were fold-out things resembling a cross between dangerous goods stickers and furniture assembly instructions. 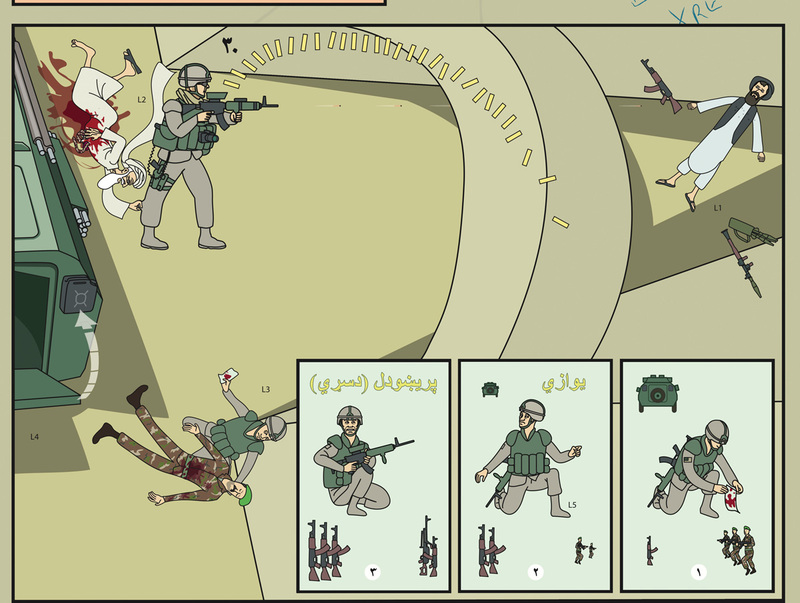 They laid out a kind of visual dictionary of militarily pertinent objects and situations. Shown a series of cartoons a local could simply point out a concept, say; a man/alone/with a beard/of average height/with a cell phone, and the ‘Ferengi‘ (western soldier) would comprehend. Obviously these could be conversations of great importance and getting it right mattered. But translation is as complicated as culture. The pamphlets sort of worked. Little things, like dynamite (a red dowel with a wick and hash marks) which needed no explanation for young Canadians failed surprisingly with people not familiar with Bugs Bunny, television or, presumably, sticks of dynamite. A strip of male heads, in another example, showing a variety of hair styles led, I was told, to wasted moments of outrage and confusion. It was this inability to understand, not only language but the larger culture itself, which drew me into the translation pamphlets as a form within which I could retell stories I was myself struggling to understand. I’ll mention that for me a tale is somewhat removed and more open to distortion than a story. I was told stories and fashioned tales – this is an idiosyncratic distinction, I mention it here to avoid confusion. Now that I had a form to work with I set about scraping away what wasn’t a part of my developing imagery. Gone was the purpose of education, of persuading (with the promise of good intentions and good fortune). The size and shape would now be appropriate to an object of worth in its own right; the drawing would become a work of art, not a folded publication used as a job aide. Instructional sections would give way to a chronological narrative, made up not of general situations but distinct moments of time and place. The public addressed by the drawings would also change, so instead of depicting familiar scenes to people with other concerns these scenes would appear as foreign, being displayed now for someone looking for something to look at. Rather than published comics the stories became prints, light jet prints mounted on aluminum. This is a fairly common medium in art galleries as is the practice of printing an edition of the same work. The largest of these editions contains 12 prints, so this was not a form of mass production or publication. Like an intaglio printed from a copper plate on a press these drawings would have no original. Drafted on a computer they were created through printing and must be seen in person, although there are small images of them in the catalog and online (the images accompanying this article for example). With this new palimpsest I could begin telling a tale while at the same time drawing a drawing, or kind of drawing. Like the actual tablets and scrolls of some far off time, any previous form can be scraped clean to be recycled as something new. In art this recycling allows for a new take on a subject within an existing medium. Media contains its own meaning intrinsically and I made use of that. 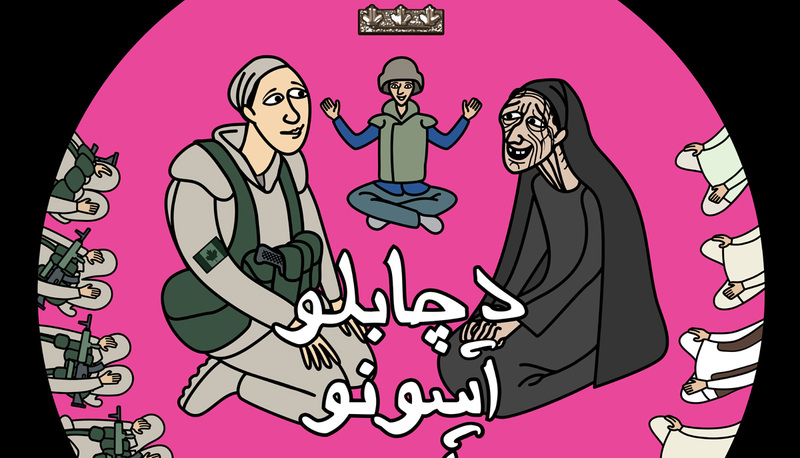 Parenthetically; these illustrated stories can be understood to have something to do with translation and comprehension because they are themselves in the form of an educational picture book in a foreign language. The materials and methods used to create the work effects how these stories will be ‘read’. The telling effects the tale. I began learning the language; instructional pamphlets have their own rules. If I followed these rules I found that the resulting graphics looked remarkably similar to their seminal cartoons. These weren’t copies in whole or in part but depictions of a kind of graphic presentation. Pieces of existing translation pamphlets would not be collaged into a new story form. Instead, I co-opted the visual thinking that was behind the pamphlets. This distinction between reproducing and assuming the original does contain a difference in these drawings, which are concerned with how we remember as well as being tied to the particular event. The anatomy of all things were simplified, smoothed over and held at a distance. Sometimes I would draw characters within a scene but often each thing floated apart from all the others like individual items in a catalog of memories (or picture dictionary). Afghan rugs with their crude representations of current events are similar in many ways to the language pamphlets and they became an influence as well. It really wasn’t my style of drawing so I had to learn the rules just as I had to learn to draw the letters and numbers of a language unknown to me for the text. I say draw because I was truly drawing each letter without any understanding of their meaning, which was researched and confirmed by others who did know. The whole process was quite alien and uncomfortable, like learning algebra in school, but it became more natural as the creative forgery progressed. My work was checked, sometimes repeatedly, with the story tellers. I didn’t want a fiction but an accurate recreation of the event. That this is impossible was a given but working through memory and the limits of representation was at the heart of the work. One of the soldiers I spoke to was Rob. His recollections, and critiques, were the most involved of all those interviewed. He was a member of the Canadian Battle Group, Task Force Orion, operating in the Panjwai district, South West of Kandahar in the spring of 2006. A typical exchange, while working on Rob’s Story, the most complicated of the narratives, would involve mistakes in chronology, and the wrong people doing things, in addition to the correction of small details in many of the scenes. Rob’s story is a polyptych of four panels, 345 by 160 centimeters in total. It begins at a quotidian pace which is changed in a series of violent events before becoming calm again in a familiar signal that the tale is ending, but unlike most narratives this one is purposefully unintelligible as are the pamphlets that inspired it. There is a kind of plot which can generally be followed but it takes effort as the sparse text is in Pashto and the whole thing reads from right to left, as in Arabic script. The events take place within a single day and revolve around the loss of an officer as she is wounded and later dies. A number of other recurring characters are also killed in the scenes or would be killed soon after so it was a very dark story for Rob to tell, myself to have drawn and for the viewers to take in. One of the more easily followed scenes, from the second panel, presents a soldier shooting a man while another dies at his feet. The battle writhes on with yet another casualty abandoned, along with his care giver, as the armies advance and recede in a succession of images similar to playing cards. Reading these tales takes some work as I don’t always give you want you want. What is gained in presenting Rob’s story in this way is a sense of the moment, what is lost is some detail and accuracy, but that’s the nature of translation and recollection. Horrific images do occur in the drawings. Within popular culture there is a history of gruesome imagery as entertainment but there is something different, I think, in knowing that this did happen and these people suffered in the way that is shown. There certainly was a difference in my mind between making these images and watching the latest zombie movie with similar imagery. I could have widened my sources, reading published accounts and interviewing more participants, but I wasn’t interested in journalism or history. I think this is why I have simply stuck with the titles of ‘so and so’s story’, as if to say “this is what happened and it happened to me”. One of the characteristic qualities of this group of work was the use of alternate national or individual perspectives. Perhaps most noticeably in Rob’s Story, the particular is emphasized (small and at times seemingly pointless visual details inhabit the drawings), giving the scenes the bizarre unexpected quality that I find true to life. Shawn’s Story is a single print which centers on a life and death decision which Shawn, who was the ‘Sheriff’ for the forward operating base at Masum Ghar at the time, must make. A man is brought to the gates through a battle at night. Badly wounded he needs more than can be given. 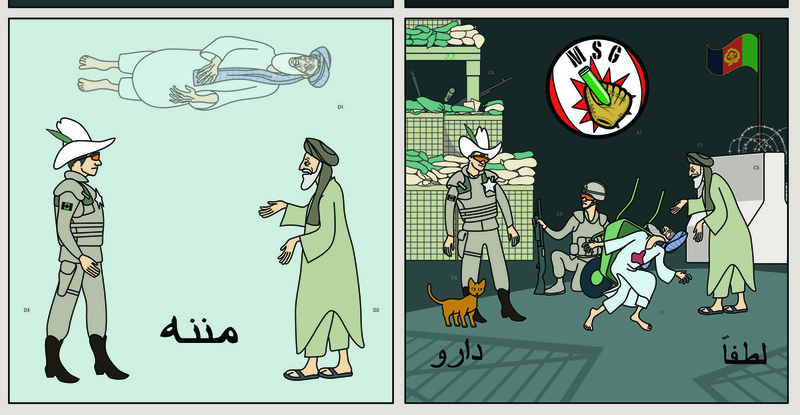 Shown here are the bottom two scenes in which the dying man is presented to Shawn under an invented logo for FOB Masum Ghar (a baseball glove catching a rocket). The scene is arranged something like that of the Surrender of Breda, with soldiers, civilians and a cat all acting as witness. In the final scene the dead man floats above his surviving friend who comes to the sheriff with open arms. What is expressed, who is the man, what was the fight all about? Again, the details are lost in my telling of the story. Only four scenes tell the compressed story above which is a collection of icons, lifted from various places in and around the base. A backwards bullet proof glass logo, various company and squadron symbols, Will Ferrell (Ron Burgundy) as stencilled graffiti, and a sheet metal design from a civilian water truck are just some of the visual items included. These would roughly correspond to the posters, traffic signs, and coffee mug designs of your own lived geography. The last print I’ll talk about is Renee’s story which is a single image. Renee worked with a CIMIC (civilian military cooperation) team. Her special role became one of connection to the communities through local women. All of the artwork from this project can be seen as the spirit of a moment taking over some medium to become visible to us. Sculptures, souvenirs, comics are all taken over here for that purpose. Renee’s Story assumes the image of a giant coin. In military Afghanistan metal coins were discouraged, instead silent cardboard gift certificates,‘Pogs’, were carried for purchases at the coffee shops and stores of the rear areas. In Renee’s Story, like the other prints, little is given to help negotiate the scene at first. But with a closer examination of the drawing, quite a bit about her situation and that place can be inferred from the stilted arrangement and postures of the participants to the fact that only the green clad people have guns. A special place is made for the Afghan translator in the scene between Renee and a very old Afghan woman, who enjoy a careful conversation under the watchful eyes of the men. What I especially like about this story is the view it gives me of the way in which people place themselves within group settings according to rank and affiliation. Renee’s Story is more similar to the sculptures of Light Horse Tales in simply presenting the scene. Rob’s and Shawn’s Stories differ by containing time as an element. The capability of graphic narratives to represent something happening, not simply being, was what I needed. Comics roll out events, while at the same time producing distinct images that stick in the mind to remain, in some cases, as icons. And that pop culture, primary color attitude, which some comics own, set the tone perfectly against the backdrop of the much simpler contingent existence of life in rural Afghanistan. The process seems very rational and calculated written out like this, but it wasn’t. It was just a series of gut reactions, choosing what felt right as things developed. In telling these true stories I chose to leave in my own lack of understanding, making that failure a part of each tale. Pictures combined with text as graphic narratives have a unique way of adding to our understanding of the events they depict. The way in which they do this can also make visible the frustrating lack of comprehension that we all have to live with. This is a very close examination of a set of prints with more explanation than most people would want. But I hope it is a welcome addition to the conversation among those of us who have an interest in the how’s and why’s of the (comics) art. Comics, and graphic narratives more widely, offer a unique way of seeing our world. The ability to include time without motion allowed me to tell these stories while at the same time laying out a visual portrait of the two cultures involved. To do this Afghan rugs, military pamphlets, and personal recollections were all recast in a new form. It was very gratifying when, at the opening of the last exhibition several months ago, a woman told me as she was leaving, “I’ve seen the news and read about it, but I never really understood what they went through over there until I saw this show”. Al Henderson is an artist whose work ranges from the handheld to the monumental. A focus on individual representation is common to most of his work. This fall he will be teaching in the University of Alberta’s Sculpture Department and he is currently creating an artwork for the new Rogers Place Arena, Edmonton. He has been making public art for the past 14 years. Produced with the generous support of the: Alberta Foundation for the Arts, premiered at the Douglas Udell Gallery 2011, followed by the VAAA Gallery 2011, OAG 2015. To be fair; I have to say that I was most interested in the points of miscommunication in these field situations. They were humorous and quirky to me but I don’t have any contempt for them. Translation pamphlets probably do work very well in many instances making them a valuable tool. Also note that the words ‘print’ and ‘drawing’ are, for the most part, interchangeable as you read this. Look here for examples of Afghan rugs. A ‘Sheriff’ in a FOB is appointed to oversee all aspects of security: searches, patrols, animal control, medical evacuations, gate security etc. They do not wear marijuana decorated stetsons, cowboy boots or tin stars, as depicted.